How do Records appear in the Extension for my users? The list of records that appear and can be selected from within the Xton Access Manager Extension is determined by a few elements defined in Xton Access Manager (server). In order for records to appear, the following record and properties need to be created within Xton Access Manager (server). A record that contains the URL to the login web portal. Most commonly, users will use the WEB Portal record type but any record type can be used as long it contains the URL (for example, you could enter the URL into a record’s Description field). URL: Enter the URL to the login or signin page that contains the web login form. Please note if your record type does not contain a URL field, you can enter the URL into the Description. 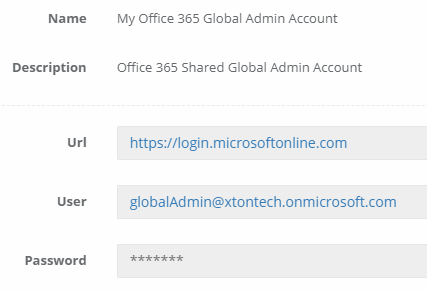 An example WEB Portal record created in XTAM server to auto-populate a Microsoft Office 365 or Azure login. This record must be Shared to all users/groups (that you want to grant access to) with at least the Unlock role. You may now configure XTAM to include users with Viewer permission. Grant Access to a user or group in XTAM server (left) and the record will appear in the user’s Extension view (right). Once this record has been created and shared, simply open your browser and navigate to the login page. Click the Xton Access Manager extension to open and finally click the Record Name to auto-populate the credentials. If only one record for this login was found, the Extension will automatically populate the credentials once opened. If two or more records are found, then the user must select and click the Record Name to populate the desired credentials. The Extension and Xton Access Manager (server) communicate in real-time and do not sync nor store credentials locally on the user’s computer. If changes are made to the record or the record’s shared permissions, the user can simply open/close the Extension or click the Refresh button to load the modifications.